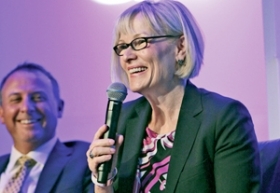 Birgit Behrendt: "We've always said we wanted our ABF suppliers to participate in our growth." TRAVERSE CITY, Mich. -- Preferred suppliers to Ford Motor Co. will get a bigger share of the automaker's purchasing budget -- 70 percent, up from 65 percent -- as the automaker continues to downsize its network of suppliers. Birgit Behrendt, the company's vice president of global programs, said today that 104 suppliers in Ford's Aligned Business Framework will get a bigger share of the pie. However, Behrendt did not indicate how long it would take to shift more of Ford's purchasing to these vendors. The company, in a statement, said it is now calling the program the Aligned Business Framework 2.0. In 2005, Ford launched its Aligned Business Framework to form long-term relationships with key suppliers. The list currently includes 76 parts manufacturers plus 28 non-production service providers. The companies in Ford's ABF program are part of a larger group of 750 suppliers that Ford considers to be key vendors. Behrendt confirmed today that these 750 suppliers will get all future Ford contracts, while an additional 400 vendors eventually will be dropped from Ford's supplier network. "We've always said we wanted our ABF suppliers to participate in our growth," Behrendt said today in an interview. "They've almost doubled their share of our purchasing budget [since 2005], and we don't think we've reached the limit." Behrendt also said the automaker will continue to facilitate the creation of minority-owned joint ventures like Detroit Manufacturing Systems LLC and Detroit Thermal Systems LLC -- both created last year. DMS is a joint venture between Native American descendent Andra Rush and French supplier Faurecia SA and DTS was created between Redford Township-based V. Johnson Enterprises LLC and French supplier Valeo SA. Behrendt said these joint ventures create opportunities for both suppliers and allows Ford to consolidate its supply base. Today's news underscores Ford's commitment to its ABF program under its new purchasing chief, Hau Thai-Tang, who replaced retiring purchasing chief Tony Brown on Aug. 1.